You may not have ever seen this bird, but it's a beauty. It's possible to mistake Great Egrets for Great White Herons since they look similar, but the egret is smaller and has black rather than yellow legs. This is our largest white heron. 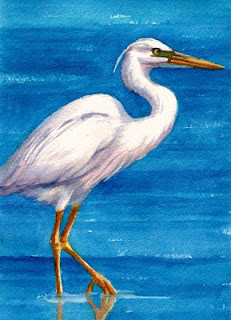 The Great White is believed to be a white morph of the Great Blue Heron, being built much the same as the Great Blue. It is found mostly in southern Florida in the US inhabiting mangrove keys, open mud flats and salt bays.